This made from scratch dinner tastes phenomenal and the kids will love it, especially if you’re in the mood for some good Mexican food! Recipe courtesy of Six Sisters Stuff. In a large skillet (or stock pot), cook beef and onions over medium heat until meat is no longer pink; drain. Stir in the beans, one can of enchilada sauce and 1/2 cup salsa; set aside. Top each tortilla with 2/3 cup beef mixture. Roll up and place seam side down in greased 13-in. x 9-in. baking dish. 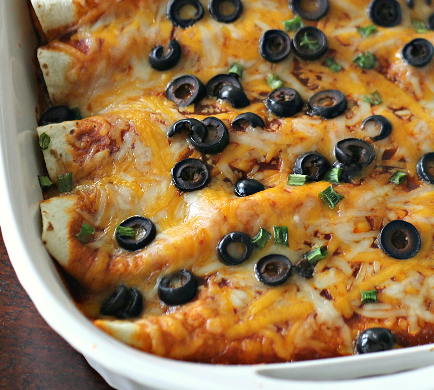 Drizzle with additional enchilada sauce and salsa. Sprinkle with cheese and olives. Bake, uncovered, at 350° for 20-25 minutes or cover with aluminum foil.